Wooden window of maximum durability due to production under German technology. Bringing this profile to perfection has taken us the longest. This profile has been the priority choice of high value among real estate developers for many years. Aluminium clad provides top comfort in wooden windows maintenance for maximum durability of the windows. Maximum durability of the window is provided by the aluminium profile that covers the window from the outside. The German aluminium profile absorbs all movements, thus eliminating any possibilities of eventual cracking. The aluminium profile also protects wood against environmental impact, yet allowing the wood to “breath” for maximum positive effect. Most other aluminium systems tend to block “breathing” ability of wood and do not protect against cracking. This is a very solid window profile that has been under constant improvement since 1997. Raw materials used for production of the window have been duly certified. Application: residential and commercial buildings. The product is durable due to aluminium clad used in the structure. Wooden article is durable due to Gutmann Cora aluminium system used on the outside. 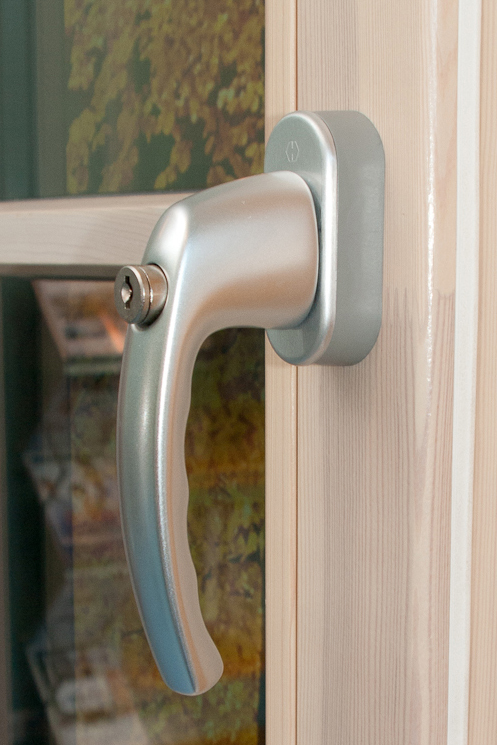 Aluminium fully covers and protects the wood on the outside. Wood is chained by Gutmann Cora aluminium system while leaving air gaps between aluminium and wood for the wood to “breath”. Nonetheless Gutmann Cora system provides full protection of wooden surfaces of the product against any adverse atmospheric impact (UV radiation, rain, wind, cold). Solid window structure allows producing windows of custom dimensions. 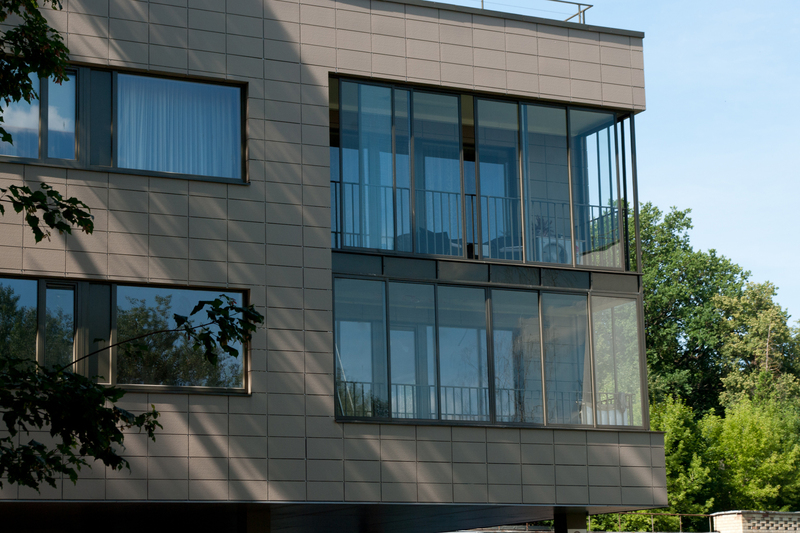 Aluminium clad does not have any direct contact with glass unit and does not support it in the overall structure of the window, leaving sound insulation properties of the window or terrace door intact. It is possible to optionally make it up to 50 dB with a special sound-insulating glass unit. 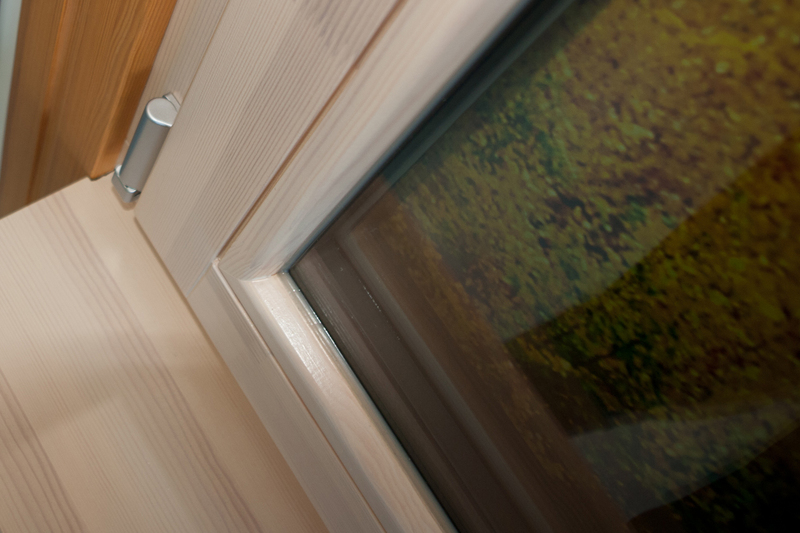 Wooden windows are fitted with extended safety hardware significantly limiting any possibilities of housebreaking. Glass units are fitted inside the frames only – the glass pane cannot be taken out from the outside. In this case housebreaking is only possible by breaking the glass. Windows can be optionally fitted with safety, laminated glass panes. Windows can be optionally fitted with safety, tempered glass panes. Windows can be optionally fitted with locking handles to completely limit possibilities to open the windows from the inside. Opening method of the window for safe cleaning from the inside. Traditional or unconventional: trapeze, arch etc. Aluminium can be coated with a colour from RAL and NCS palettes. Interior side can be coated optionally by varnish of a selected shade or RAL and NCS paint. The interior side can be coated with varnish of a selected shade or paint. 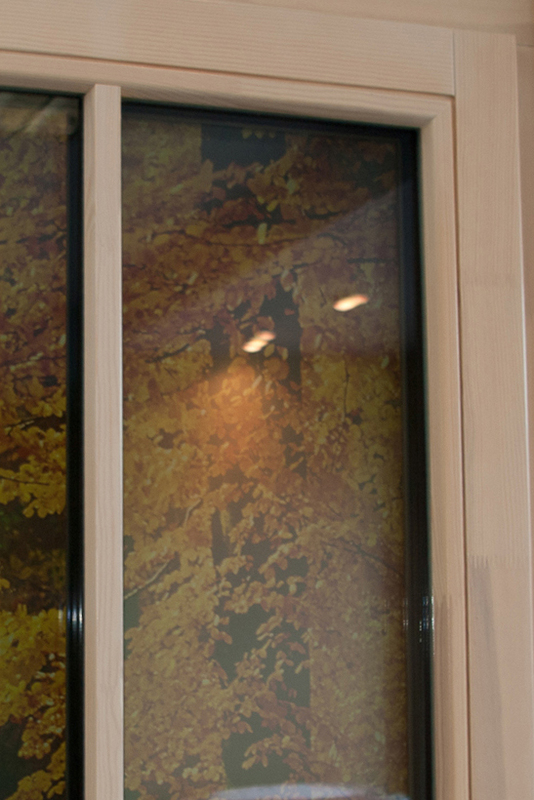 Wooden windows can be decorated with real or dummy glazing bars. Wooden window can be fitted with a glass unit made of two or three glass panes. Glass unit is fitted into the wooden frame without resting against or any direct contact with aluminium, thus maintaining maximum thermal insulation. Special silicone is used during production to secure glass unit in the window frame and protect the glass unit against any microscopic gaps and mould. (3 glass panes: 2 glass panes provide thermal insulation, filler – inert gas). (2 glass panes: 1 glass pane provides thermal insulation, filler – inert gas). 3. Sound insulating glass units. It is possible to make it up to 50 dB by fitting thicker or special laminated sound-insulating glass panes. 8. Glass units using atmospheric effect to keep windows clean (BIOCLEAN). All wooden windows with opening and tilting functionality provide ventilation possibility by setting them to micro ventilation position. Air vents can be fitted on the top of the glass unit. Note: it is first important to consider thermal losses prior to fitting the air vent. Wood and coating quality determines durability of the end product. Fingerjointed or solid pine, larch, oak. Wooden windows and doors are manufactured entirely of glued wood, using timber. Gutmann Cora aluminium clads are paint coated under special technology. Colours can be chosen from RAL or NCS palettes. Surfaces painted by powder coating are almost maintenance-free. High quality coating technology applied on the aluminium provides seamless protection against UV radiation and significant temperature variations. Powder coating technology is cost-efficient, eco-friendly, and ensures aesthetic properties of the coated articles. Solid, quality hardware enhancing functionality of the window. Wooden windows and doors are labelled with CE marking. Wooden windows and doors comply with requirements established by the EU Construction Products Directive. UAB “Sumeda” has aligned its management system with standards ISO 9001:2008; ISO 14001:2004; OHSAS 18001:2007. UAB “Sumeda” has been accredited by the Ministry of Environment of Lithuania. 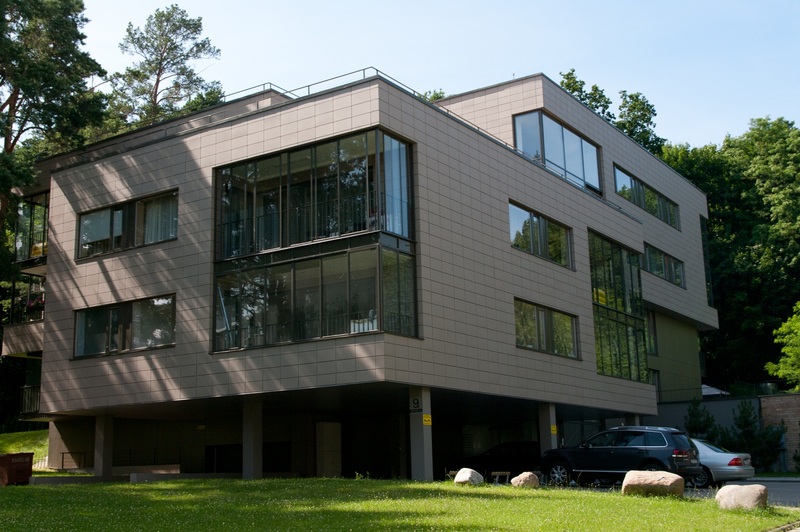 UAB “Sumeda” is a member of the Lithuanian Association of Windows and Doors Manufacturers. Quality of wood timber and its compliance with the required specifications of raw materials is proven by BM Trada certificate and FSC Council accreditation held by the supplier. Wood gluing processes are carried out according to DIN EN 204, D4 standard. Certified in accordance with ISO 9001, ISO 14001, NWPC Certificate for approval of wood preservatives (Norway), PYR certificate (Finland), Swedac Ackrediteringsbevis Accreditation certificate (Sweden) and others certificates corresponding to each country’s requirements. Implemented ISO 9001 system, DS certification, products comply with DS/EN 1279.1 requirements. Powder paint coating complies with quality requirements, such as GSB International (quality mark for aluminium components used for construction) and SFS 5795 (SFS – Finnish Standards Association). Siegenia-Aubi (Germany) hardware are in line with company’s Quality Management ISO 9001 certification, the companies focus on quality is reflected in an expanding product range that meets – and often exceeds – the reputation of “Made in Germany” standard. The product is 100 % recyclable. The product has been made of natural materials. It does not accumulate electrostatic charge. Harmless finishing materials. Windows and doors are completely harmless to health, as raw materials used for production meet the highest requirements of health, application and environmental safety established by the EU regulations. Robustness of wooden window structure has always remained the priority of the system developers. Robustness is provided by quality treatment. This product features very good static qualities and resistance to deformation as it has been produced of timber made of glued prime radially-cut lumber. 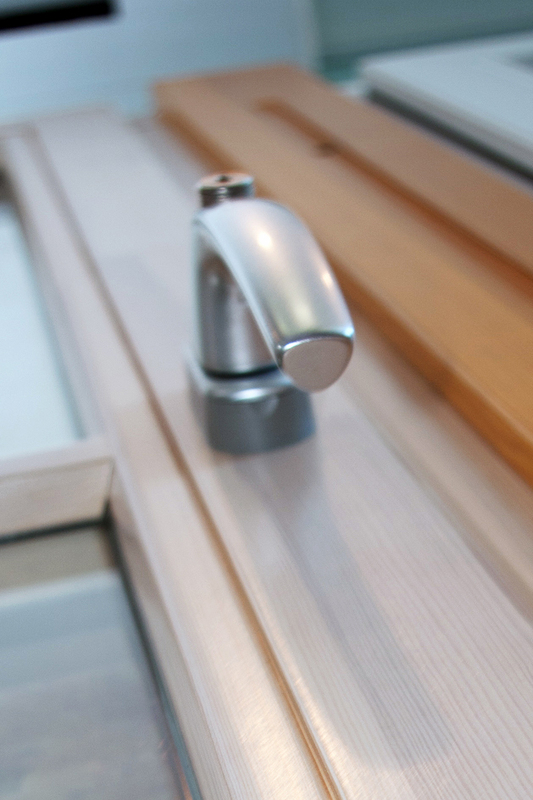 Gutmann Cora aluminium system for wooden windows is a special product developed in Germany. It presents a separate aluminium system fixed to the surface of a wooden article. This system uses 1.7 mm thick aluminium with high tensile strength, smooth surface and colour. Due to special configuration of the profile, aluminium does not move or deform in the course of time. Aluminium coating is fixed by plastic clamps that protect the wood and firmly hold aluminium while absorbing any tension and preventing the wood from cracking. Air gaps between aluminium clad and wood allow the wood to “breath” without compromising full protection of wood against adverse atmospheric impact. Aluminium clad is clamped in the corners by metal joints, protecting the coating against cracking. Wooden windows are produced using German WEINIG system. WEINIG brand is the token of technological advantage. WEINIG ranks top among wood processing industry systems as the world’s leading brand offering premium ideas and technology. This is the reason why UAB “Sumeda” has chosen WEINIG as its reliable partner in order to create long-term value for its customers. WEINIG equipment allows us to offer our customers a variety of windows and doors and be sure that they will ideally match the design, because WEINIG guarantees high standards of its products: maximum precision, uninterrupted material feed, top quality of surface treatment. Articles with aluminium clad do not require repeated paint coating or any special care products. Aluminium clad should be cleaned twice a year with warm water (max 25°C), small amount of neutral or low alkaline detergents can be added. Soft non-abrasive cloth should be used during washing or cleaning. Detergents used on the washed surfaces must be removed within one hour.